This half level certification is an excellent option to get certified while on vacation. It takes only two days and includes two open water dives. 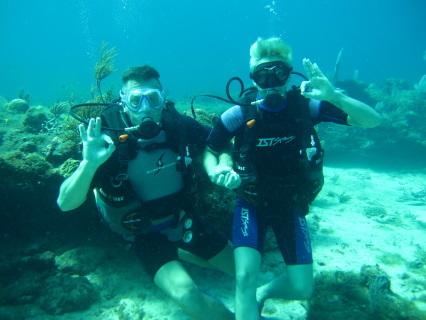 PADI Scuba Divers can dive to a maximum of 40 feet and under the supervision of a PADI professional. Dive under the direct supervision of a PADI Divemaster, Assistant Instructor or Instructor while applying the knowledge and skills they learn in this course, within the limits of their training and experience. Obtain air fills, scuba equipment and other services when diving under supervision. Under supervision plan, conduct and log open water no stop dives (no decompression) only when properly equipped and accompanied by a certified Divemaster, assistant instructor or instructor in conditions in which they have training or experience. Continue dive training to complete their PADI Open Water Diver certification and certain other courses such as the Project AWARE and Equipment Specialties.